Accurate production of nanoscale features on semiconductor chips is essential to their performance, but typical design tools cater to the dominance of straight lines and right angles in traditional chips, not the curved features needed for new device designs. Researchers at NIST created new open-source software to help chip designers create smooth, complex curves, enabling the development of new kinds of semiconductor chips. 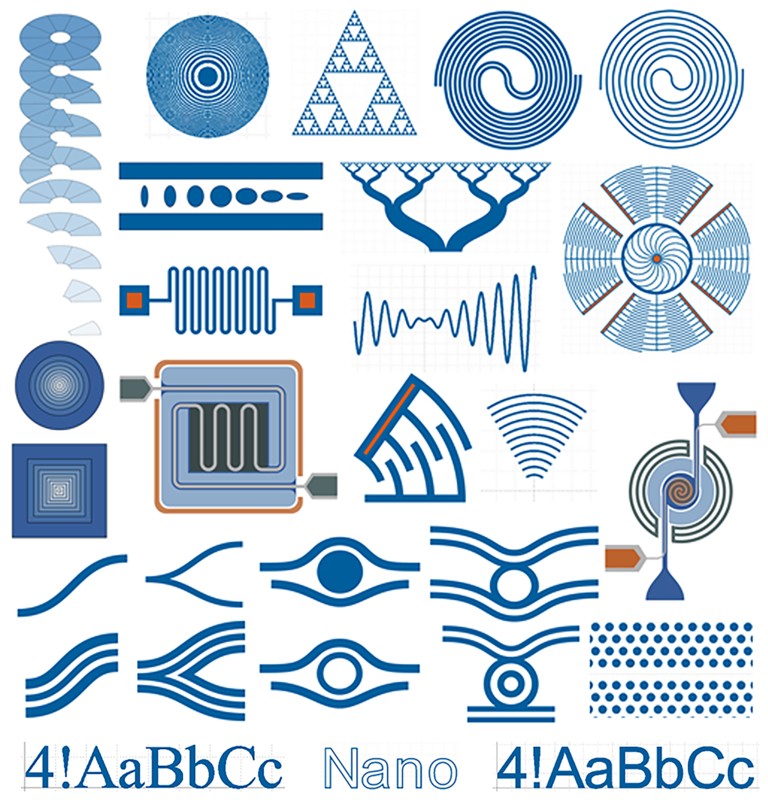 Illustrative subset of parameterized shapes available for nanoscale photonic, electronic, mechanic, fluidic, and other applications. Overcoming a major hurdle in producing new types of nanoscale devices, experts at NIST created the Nanolithography Toolbox, an open-source software package that allows users to produce smooth, complexly curved designs in a standard file format. Researchers use these designs in new devices that have unique mechanical properties and guide light in new ways. The toolbox has been downloaded more than 1,300 times. Nanolithography techniques carve away tiny amounts of material, layer by layer, to create special designs with highly tuned properties. Existing software packages, optimized for traditional electronic circuits, produce designs with straight lines and right angles. Attempting to create curves for other kinds of devices can result in features with jagged edges, which significantly affects performance. To solve this design problem, NIST scientists developed a computer-aided design (CAD) software package for scripting and streaming complex shapes to a file format most nanolithography tools use. The Nanolithography Toolbox uses the freely available, Java-based (JGDS) library for encoding shapes to GDSII objects. It runs on Linux1, Windows and MacOS, and is free for users to download from the NIST website. "The Nanofabrication group at Roche Sequencing Research used to spend hours in meetings with microfluidics engineers learning what shapes and structures they need. With the Nanolithography Toolbox being so easy and intuitive to use, even entry-level engineers with no background in microfabrication can do their own CAD. This has saved us a lot of time and resources."